Restaurante La Noria in Puebla, Mexico is located on the grounds of a former 16th century hacienda named San Miguel La Noria, for which the restaurant is named. 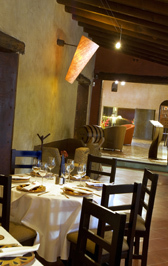 The restaurant opened in 1989 and is located in the former stables for the hacienda. 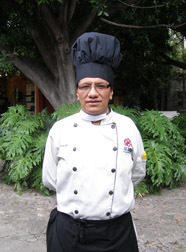 The setting is gracious, and the cuisine features traditional Cocina Poblano (cuisine of Puebla) as well as European contemporary cuisine. 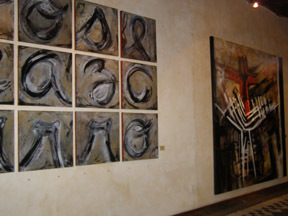 The ambience at Restaurante La Noria is at once attractive and welcoming with its high ceiling, tile floor, terracotta accent wall, large-scale contemporary paintings that grace a white stucco wall, substantial mirror, and two metal art tables accessorized with red gladioli in three black metal vases in the reception area. The details of the restaurant are lovely, and as I walked through the restaurant, I noticed a well-stocked silver bar, that upon taking a closer look, I realized that it was made from paste and had imprints of culinary instruments including spoons of various sizes, forks, and other kitchen items, and then painted with silver to create a striking design look. 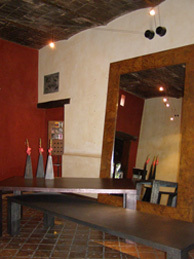 I saw that the restaurant also has an excellent wine cellar featuring a selection of international wines. I had a lovely lunch at Restaurante La Noria in late October 2009 where I sat at a table in the dining room overlooking the pretty courtyard and the garden where patrons were having lunch, and small birds also enjoyed their lunch from the feeders suspended from the trees. 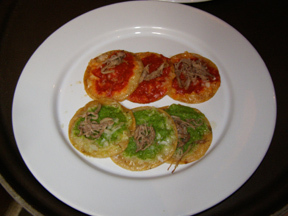 The menu offers many delicious traditional Cocina Poblana recipes including Queso Poblano, Chalupas Poblanas o de Mole con salsa verde y roja o mole poblano, which are small corn tortillas that are lightly fried and topped with red or green salsa or mole, Pipián Verde which is a pumpkin seed sauce, and Mole Poblano, one of the most famous of the Pueblan dishes, which is a rich and spicy sauce made from chocolate, a variety of chile peppers, tomatoes, onions, spices, and plantains that is traditionally served over chicken or turkey, to name but a few of the typical recipes. 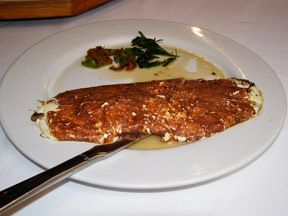 To begin my Cocina Poblano experience, I selected a first course (entrada) of Queso Poblano relleno con poblano, champiñones, y cebolla, which arrived as a generous portion of golden brown melted poblano cheese that was folded in half and resembled a large omelet that was delectably filled with sautéed poblano peppers, mushrooms, and onions, and accompanied with warm tortillas inside a specially designed embroidered tortilla linen. Paired with a glass of fresh fruit juice, this was a delightful introduction to Cocina Poblana. 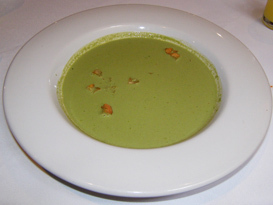 After my ample portion of Queso Poblano, I decided to have a lighter second course, and selected a soup (sopa), Crema de Cilantro con nuez y croutons, which was cream of cilantro soup with minced pecans and garnished croutons that was very tasty and was another generous portion that was presented in a large white bowl. Although the desserts sounded wonderful, after my more than substantial two courses, I ended with a steaming cup of café con leche, (coffee with milk), and spoke with Chef Fernando, which was the perfect finale to my lunch at Restaurante La Noria. Restaurante La Noria is open Monday through Saturday from 1:30 pm until 11:30 pm, and on Sunday from 1:30 pm until 5:30 pm.